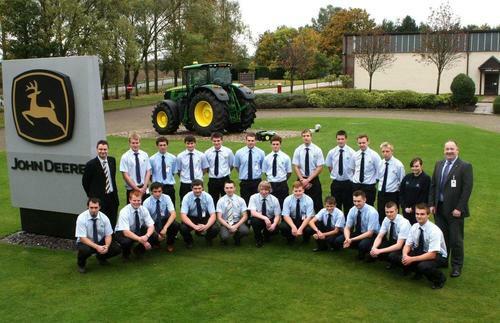 John Deere’s award winning apprenticeship programme has set yet another record for the new training season’s intake, for the third year running since Babcock took over delivery of the courses in September 2010. Altogether 56 apprentices – up by 10 on last year – have signed up to begin their first year of training in the work-based programmes, which have been joined for the first time this year by the new Customer Service Tech qualification (see earlier release). The new intake includes 44 Ag Tech apprentice engineering technicians, two Customer Service Tech, six Parts Tech and four Turf Tech technicians. Overall the John Deere apprenticeship programmes offer either an IMI-awarded VCQ level 3 land-based engineering qualification, IMI VCQ level 3 parts operations qualification or IMI VCQ level 2 customer service qualification. In addition, completion of the John Deere Ag Tech or Turf Tech apprenticeship is also recognised by the industry-wide LTA (Landbased Technician Accreditation) scheme at level 2. The IMI (Institute of the Motor Industry) is the apprenticeship programme’s new awarding body from this year. This is the first time the Institute has offered land-based qualifications. The graduating apprentices can go on to complete three free courses to gain the John Deere Diploma and start their adult training at the John Deere University (JDU), using the knowledge and skills gained from the initial one-, two- or three-year apprenticeship. Phil Elliston, an agricultural service technician at John Deere dealer Burden Bros Agri Ltd in Framfield, East Sussex, was named apprentice of the year in the most recent Ag Tech graduation group, earlier in 2013. “I’m now a qualified technician, working mainly on tractors, Gator utility vehicles and combine harvesters,” he says. “It’s a high tech industry that uses the latest diagnostic equipment – my laptop is an important tool – but the apprenticeship gave me a good grounding in the skills and expertise I need for the job, and now I’m building up my experience.